Is This The Cliff or Has That Ship Sailed? One of my favorite books growing up is Shel Silverstein’s book “Where the Sidewalk Ends” and it’s iconic front cover of kids looking under this thin ledge only to find that much of the ground is already gone. I have been noticing for years the softening of the rental market especially in Class B type units B (typically slightly lower quality and less amenities). This was especially evident when I had a client tell me that government-reimbursed programs were compensating him more than what he could get on the open market. This piece in Bloomberg highlights how Seattle, San Francisco, New York, Portland and D.C. market rent rates have cooled. Rental markets are hard to track in my opinion because landlords don’t routinely market through consistent mediums. Not all rentals are on Zillow, Craigslist nor the regional Multiple Listing Service (MLS); where MLS tends to have more than 90% of sales. Rental markets are driven by supply and affordability. If consumers have more to choose from, they will feel empowered to negotiate or look for less expensive units. If the “rent is too damn high,” people will not be able to qualify or simply cannot afford to pay the rent. We looked at a few neighborhoods to see if the rental market is down and since when. We exported every transaction that was recorded in the MLS since January 1, 2009 for one and two bedroom rentals in zip codes that roughly correspond to neighborhoods like Capitol Hill, the Connecticut Avenue corridor, Petworth, Anacostia and Dupont Circle. 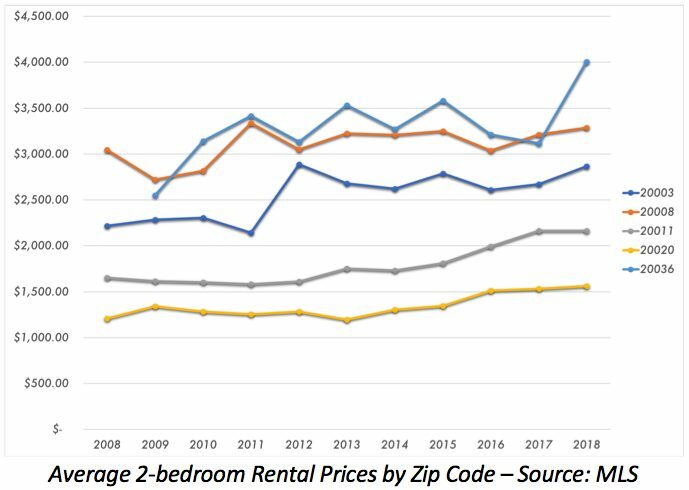 Rental prices for 1-bedroom and 2-bedroom units show a gradual increase from 2009 through 2017 in all of the zip codes that we looked at. So far, in 2018 the increase in rent prices across the city has experienced a slowdown for 1-bedroom units, while 2-bedroom rents are still rising. One thing to note is that there is a yearly slowdown in the rental market during the upcoming months of September through December so the average prices for 2018 are expected to decrease. With the average rental prices for one-bedrooms units in 2018 already as low as 2016 levels, the drop off could be even more severe. Based on our findings it appears that the flat nature of 1 bedrooms is indicating a likely pending decrease in the near future. Landlords and tenants will play a bit of cat and mouse of negotiations until values stabilize. 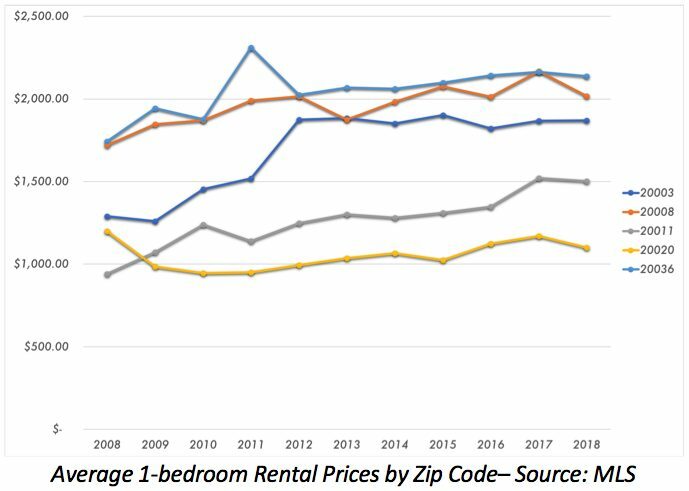 I have often suggested to landlords that one month’s loss of rent revenue is not worth waiting for the higher price, but of course, this is not always the case with rent control properties (We are not opening this can of worms for this discussion because of the intricacy of the regulations in DC). If you own a 2-bedroom the time might be prime to maximize revenue before those begin to see likely decreases as 1 bedrooms drop; since we presume much of those properties’ success is driven by tenants either living together to decrease their own cost or couples/families need or want the added space. Facing a future without Facebook ‘likes’ and ‘shares’?